The IITC Plantar Analgesia Meter for thermal paw can be used on 12 mice, 6 rats and other animals (cats, rabbits) unrestrained when testing for narcotic drugs. Experiments are easy to perform, simply slide the test head under test subject, align the heat source via our exclusive guide light (idle state) by the attached, adjustable, angled mirror on test head to test subject and perform tests. Start, stop and reset of tests is done by either the pushbutton on test head, front panel controls or supplied footswitch. With our exclusive “idle state” of the heat source one is assured of exact placement of the heat source i . Tests are performed on the plantar surface by a focused, radiant heat light source. The light beam is focused to the top of the glass and creates a 4X6mm intense spot on the paw. Our method of visible light is superior to the infrared light method, since a user will not always know exactly where/when the test will start, causing false starts and conditioning of animals. A built-in timer displays reaction time in .01 second increments. The height of the glass is adjustable allowing the focal point of the light to be adjusted to stimulate other body parts if needed. A Humane cutoff timer is standard. The unit can be preset for a cutoff period, at the end of which the heat source shuts off automatically if the animal has not responded, avoiding tissue damage. Our test head does not emit , clicking or whining noises that cause preconditioning of animals prior to test as with other systems on the market. Our exclusive heated glass option eliminates the glass acting as a heat sink. This feature will eliminate the reaction time of the animals to be altered due to the fact that they are placed on cold glass allowing the possibility of delayed response time to the applied heat source. Built-in heating elements in the glass which are digitally controlled for consistent temperatures. Temperature readout and adjustment from 30-40 degrees c. for the heated base is controlled on the heated base. 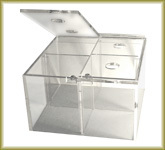 Three individual, acrylic animal enclosures are supplied. Each enclosure allows for 2 rats/4 mice allowing testing of up to 6 rats/12mice total. Enclsoures have strong magnets to prevent animals from possible escape., individual lids, clear dividers in-between test subjects. Adjustable beam intensity in 1% increments room temperature to 250 degrees c.